Thank goodness, daylight saving is just round the corner. I'm delighted that I no longer have to walk home in the dark at 5.30pm. It's pretty chilly outside which means I'm still bundled up in my thick woolies, shawl and boots but I can't wait to shed the layers and wear a summer dress. I've overdosed on my neutral shades which matched my mood during the winter months. 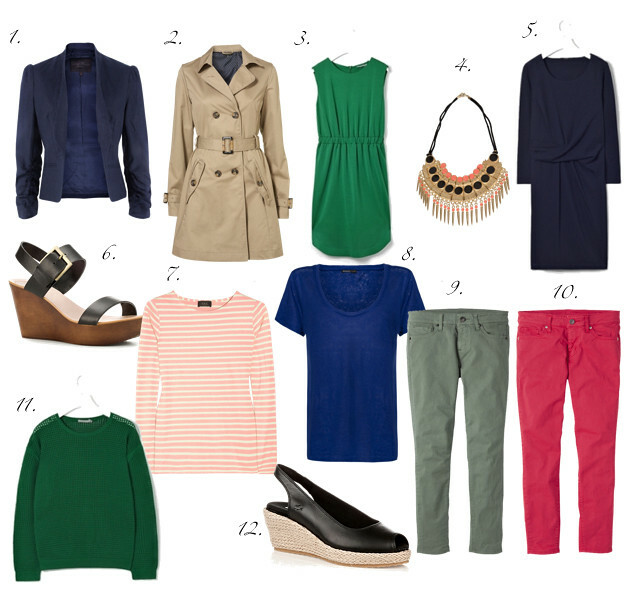 Now that the sun is finally making a daily appearance, it's time to switch to colors. Bold colors. Just like the jewel toned clothes on the mannequins in every store that I've walked past. Though I've dipped my toes into prints in the past year, I naturally veer towards single toned clothes as I find them easier to mix and match. Swap the scarf with a bold necklace and you'll get a different look. Each piece of clothing featured here is priced less than £100 but to me, the material, fit and workmanship are still three important factors when choosing clothes. Just because the clothes are more reasonably priced, they don't have to look cheap. I also prefer natural fiber to acrylic or polyester as they tend to be more comfortable and longer wearing. I've had so many compliments whenever I wear my Uniqlo jeans out so I have to include them here. I'm hoping to get a couple of colored denims when I'm in London next so that I can take advantage of their free alteration service. Hey M! I love that it stays darker longer too. I can get a whole lot more done and feel a little safer while doing so. I LOVE those jeans and that green dress is charming girl. Wishing you a wonderful day my friend. Great selections! The COS jumper is adorable. I'm definitely stopping into Uniqlo during my London visit - it's certainly one of my favorite lower-priced chains and I've always been happy with the quality and style. Never had a chance to take advantage of the alteration service, but I'm going to try this time. And thank you for your recommendation re Bicester Village...I'm definitely going to try to squeeze that in! Can't wait! Everything you picked out here is great. The trench is my favorite. You really came find wonderful trenches in just about every price range. anyway i love this post 'cos i also believe that affordable clothes doesn't mean cheap and poor quality just like in your set! love the stripe top and mango shirt! those jeans also beautiful for spring!!!! I'm a huge fan of Uniglo super skinny jeans , and swept up a third pair in the Sale for £9 . They fit better than the Paige jeans I also love. But sadly those so cute short skinnies were an abomination on me . Too short , no fit . And even worse the ankle length capris , just not for my shape . Happily those superskinnies come in white, and fit brilliantly . The trouble is , whatever Inez may see ,I feel that they look Eurotrash . Those super skinny jeans are fantastic. I'm hoping that the ankle length will fit this shorty just right so that I may get away without any alteration. Fab picks!!! You have great taste!! Great post! I, too, tend to stick with solids and mix it up with accessories. I have stepped outside of the box a wee bit this season, but really I've just expanded into prints that work as neturals: stripes, polka dots, etc. Haha. Hey, it works. That trench is fabulous, by the way! Nice picks! I think I might have to pick up some jeans from Uniqlo from Malaysia the next time I'm back. I didn't know they had a free alteration service! Wow it is just so great. I wish I knew it saw so well. Anyway spa products are available in some countries. U can check in their website. They mail internationally too.